Volcano Art Center (VAC) is a nonprofit, 501(c)(3) educational organization founded in 1974 by a band of eclectic and energetic artists. 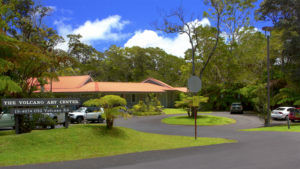 Today, Volcano Art Center continues to operate a successful fine arts gallery showcasing handcrafted art works by over 230 local artists, as well as developing and offering programs for residents, keiki (children) and visitors alike, including the award winning Na Mea Hawai`i Hula Kahiko performance series at the kahua hula in Hawai`i Volcanoes National Park. Volcano Art Center Gallery is located in the historic 1877 Volcano House Hotel in Hawaii Volcanoes National Park and operates under a cooperative agreement with the National Park Service. Centered at Kilauea, home to Pele, the Hawaiian goddess of the volcano, of creativity, of Fire, Volcano Art Center Gallery has been a mecca for visual artists since 1974. This dynamic and powerful environment has inspired the Hawaiian people and their crafts, songs, dances, and legends for centuries. Today, the Kilauea region continues to draw artists, performers, writers, scientists, and educators from around the world to create, reflect, learn and embrace the beauty and power of the natural world. Volcano Art Center Niaulani Campus Administration Offices and educational facility are located in Volcano Village, nestled within the Niaulani Rain Forest. From the steaming edge of Kilauea to the nurturing wet roots of the old growth `Ohia forest, Volcano Art Center staff, board, artists and supporters know we are blessed to live and work among such beauty, and a place so alive with inspiration and mana to create, regenerate and exhilarate! Sales of art work in our gallery supports our artists and our Volcano community, along with our cultural, arts education, forest restoration and professional artist development programs. Volcano Art Center develops, promotes and perpetuates the artistic, cultural and environmental heritage of Hawai’i’s people through the arts and education. Volcano Art Center is Where People, Art and Nature Meet! Click here for the Bylaws of Volcano Art Center!